The good news is that the cult TV show Beauty and the Beast is getting a reboot. The bad news is that it's going to be on The CW. Once upon a time, long long ago (the 1980s), in a faraway kingdom (Hollywood), a wise man (a TV executive with a rare good idea) managed to create a magical television show called Beauty and the Beast. 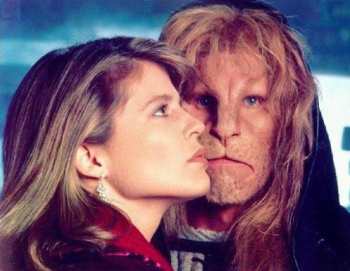 The show was strange and fantastical, and it starred Linda Hamilton (Sarah Connor) and Ron Perlman (Hellboy), so you know it was great. Now, however, we apparently live in a cursed time, because it turns out The CW is going to ruin everyone's positive memories of the show by rebooting it. So far, the network has been pretty quiet about exact details regarding this remake of the series that originally ran from 1987 to 1990, though it has been revealed that "the new version will not only modernize and CW-up the love story but also add a procedural twist." That said, Jennifer Levin (of Without a Trace) and Sherri Cooper (of Brothers & Sisters fame) will write the pilot script and serve as the series's executive producers. I don't know about you, but I'm pretty skittish when it comes to shows on the CW, since the network seems to be marketing shows purely to Gossip Girls and Twilight fans these days. Hopefully, Levin and Cooper will produce a worthwhile series that's got some appeal for fans of the original series, but odds are that it'll probably turn out to be something closer to that Teen Wolf remake.